Over time the concept of “Black Supremacy” changed. The most substantial transformation of “Black Supremacy” came during the 1950s. Oddly, it was used to incite opposition to the Mau Mau in Kenya and promote opposition to the drive for independence in other parts of Africa. Proquest shows 829 results in a search for Black Supremacy. 582 or 70 percent of those articles are from the period from 1959 to 1970. The notion of Black Supremacy fell to a new level of unreality in 1959. That year the phrase became a buzzword to attack and lump together any ideas which did not conform to the non-violent integration narrative promoted among Black people in the United States. What caused that huge increase in articles about “Black Supremacy?” We are not exactly certain but, we do know it began to happen shortly after the appearance of what could easily be characterized today as docuganda masquerading as documentary. 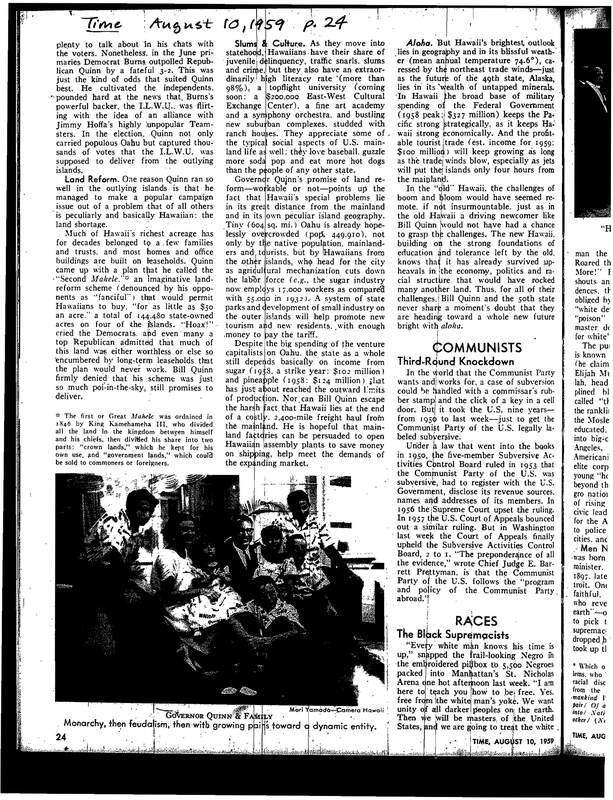 “The Hate That Hate Produced” is a five-part series which appeared on WNTA-TV, Channel 13 the week of July 13-July 17, 1959 as part of Mike Wallace’s “News Beat” show. The show uses the phrase “black supremacy” or “black supremacists” at least fifteen times. Each time it is spoken by Mike Wallace or Louis Lomax. Time went on further lamenting the fact Congressman Adam Clayton Powell and Manhattan Borough President Hulan Jack supported “the Moslems” shows Time finds deep concern with the rise of the “Moslems” and fault with anyone who does not give keep distance from them. 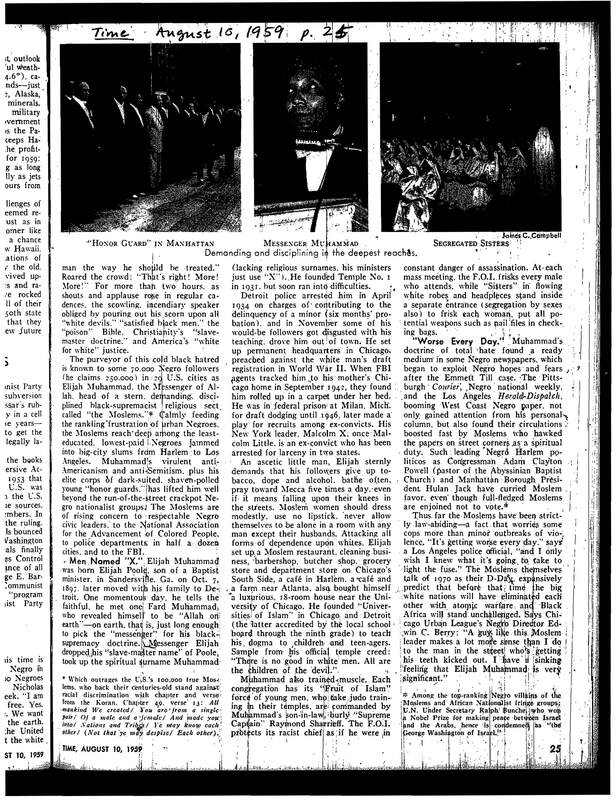 A subsequent article in the Philadelphia Tribune refers to the Time article and TV stations allegations of “Black Supremacy” against the “Moslems.” The article regrets the allegations, if true, and goes over the need to prevent a “lunatic fringe” from taking over. However, the article never contemplates the possibility that it is not true. Shortly after all the above happened, Elijah Muhammad’s column in the Pittsburgh Courier ceased to appear. In September of 1959 the General Board of Education of the African Methodist Episcopal Church met with the denomination’s General Board. They adopted a resolution to send to U.S. President Eisenhower. The were “re-affirming…basic principles of American democracy are directly at variance with discrimination based upon race, color or national origin.” The Philadelphia meeting was in preparation for the national convention in Los Angeles, California during May 1960. The group also specifically attacked “black supremacy,” condemning the efforts as “un-Christian” and opposed to the AME Church creed. The statement of Birmingham, Alabama’s Eugene (Bull) Connor shows just how irrational ideas related to Black Supremacy truly are. In April 1960 Connor made a speech in Selma, Alabama. There he announced Black people were seeking “Black Supremacy” and not racial equality in the South. Unusual is one way to describe an August 1966 announcement by Black Roman Catholic bishop Harold R. Perry S.V.D. Auxiliary of New Orleans. By describing “Black Power” as misunderstood and a “catchy slogan” meant to raise interest in registering Blacks to vote he appeared to counter King and Wilkins. The Bishop did not expect the slogan to last long. He demonstrated the error in equating “Black Supremacy” with “White Supremacy” by pointing out Black people were no more interested in the former than they were the latter.